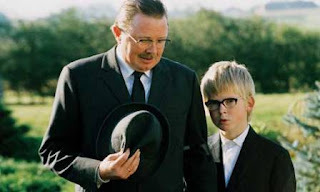 This is not a film that you're likely to forget in a hurry - Peter Schønau Fog's examination of Danish dysfunctional (with a capital 'D') family life, written by Bo Hr. Hansen from Erling Jepsen's novel, pulls off the rare trick of being both darkly disturbing and perfectly charming in roughly equal measure. The title refers not only to Henry's manipulative pretences, but also to the rousing, moving speeches he provides at the funerals that are a part of everyday life in the community. And, strangely enough, despite the film's dark core, it is the strength that can be found in community life that is actually the director's central theme - and that would be the 'perfectly charming' part cited earlier. The story is fascinating (and also, perversely enough, very funny in places) - Lorenzen gives a remarkable performance as his father's supporter, spy, even as his pimp, which is counterpointed by an equally impressive turn from Asholt as the disturbed and disturbing patriarch - his actions are appalling, but one can still sympathize with the man behind the abuser. Only Kolbech's performance, as the abused daughter Sanne, seems a little off the mark - her transformation from acceptance of her 'duties' into teen rebel does not quite convince. Then again, Kolbech won an award for her work, so what would I know, eh? Prepare yourself to be charmed, challenged and disturbed. 8 nominations and 26 wins, including Best Actress (Julie Kolbech) and the Slovak Television Award for Peter Schønau Fog at the 2007 Bratislava International Film Festival, plus Prime TV Prize for Best Film at the 2007 Brussels International Film Festival.